Beautiful Kitty! What rainbow goodness! I love this quilt, Kitty! I wish I had discovered quilting when my daughter was much younger. She would have adored an eye spy quilt. That game saved me many times while standing in a long line at the grocery store. Beautiful quilt, but I don’t think i would worry too much about the quilting, as Max is more interested in the color and the characters. One of my favorite scrappy quilts, which I found in an Australian magazine, years ago, is to use squares, of the same size, piece them 5 across and 7 down, making 35 squares. Add a strip of the same measurement as the square, to either side, making it a square block. Then you piece the blocks, one standing up, and the next laying sideways. I do have a picture of it on my IG account, barbhana, and will add another, in a few days. 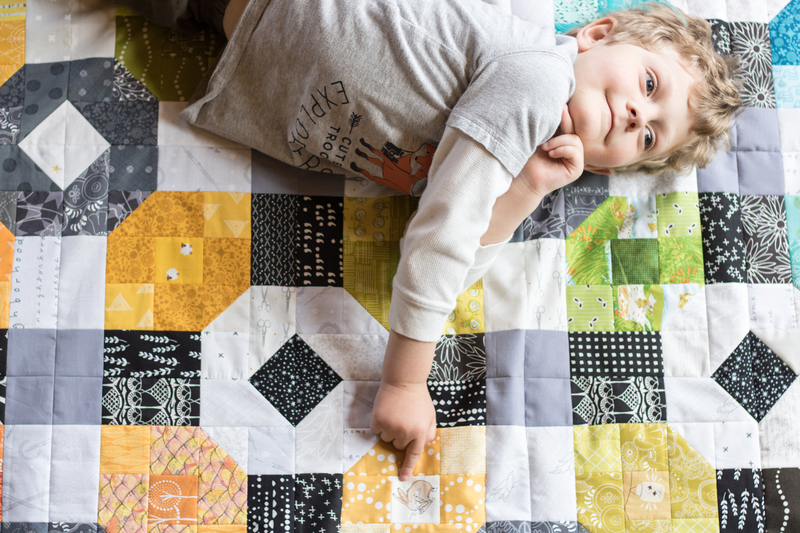 Such a happy quilt and perfect for your little guy. I have no idea on the quilting; I draw a blank when it comes to that on just about any quilt. And yes, you definitely need Amanda Jean’s new book! This turned out beautifully! I bet that “favorite” blocks will chance over time. They certainly do for me. 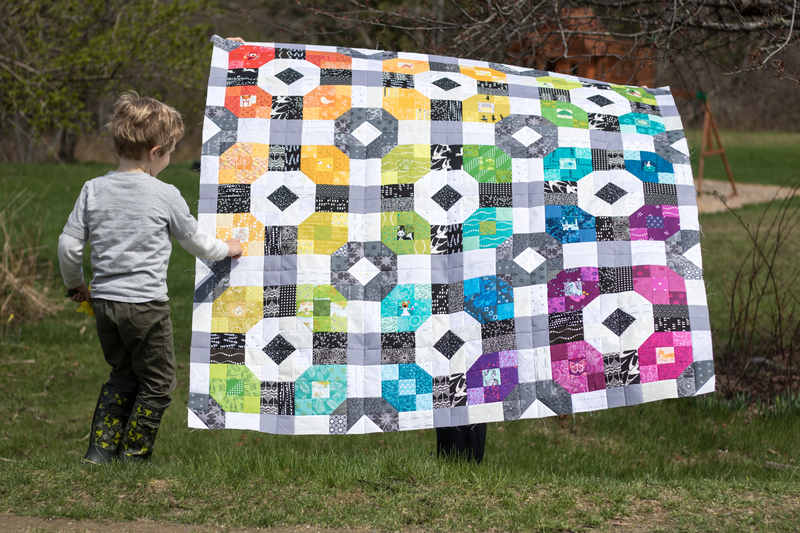 🙂 I personally think that a loose all over quilting design will hold up just fine and how excited would Max be to get this for his birthday??! I just love this Kitty!!!! 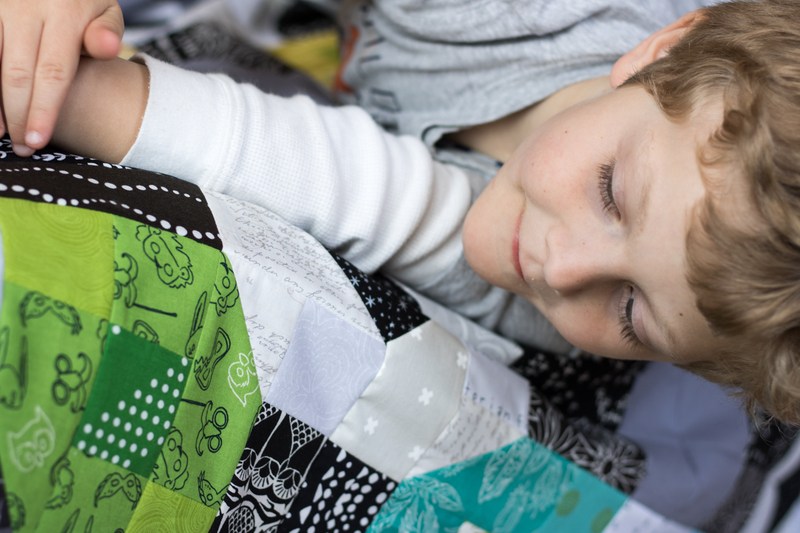 So glad you have found the draw of scrappy quilts – you will be addicted. Interesting to read how you co-ordinated parts of the quilt too for consistency. Hmmm quilting – so difficult to advise. My daughter is still waiting for her birthday quilt from last September so I am tempted to do a quick all over design but part of me wants to go all out. Look forward to seeing what you decide. If you want an all over pattern that kind of combines ease and fairly dense quilting, maybe a spiral pattern? 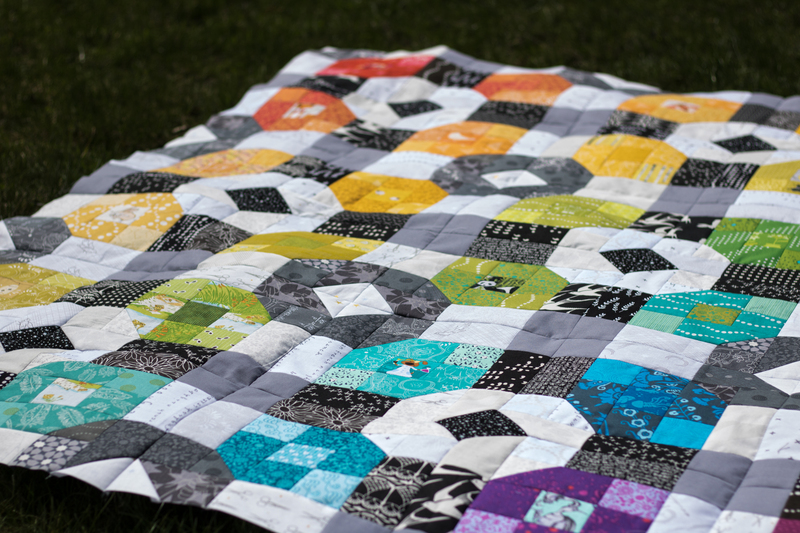 It will complement the wheel-ish look of the black and white blocks, and you can spiral as tightly or loosely as you feel would be sufficient for the wear the quilt would get. Likewise, you can use one color thread all over, or start in a corner and change as you go through various colored sections. 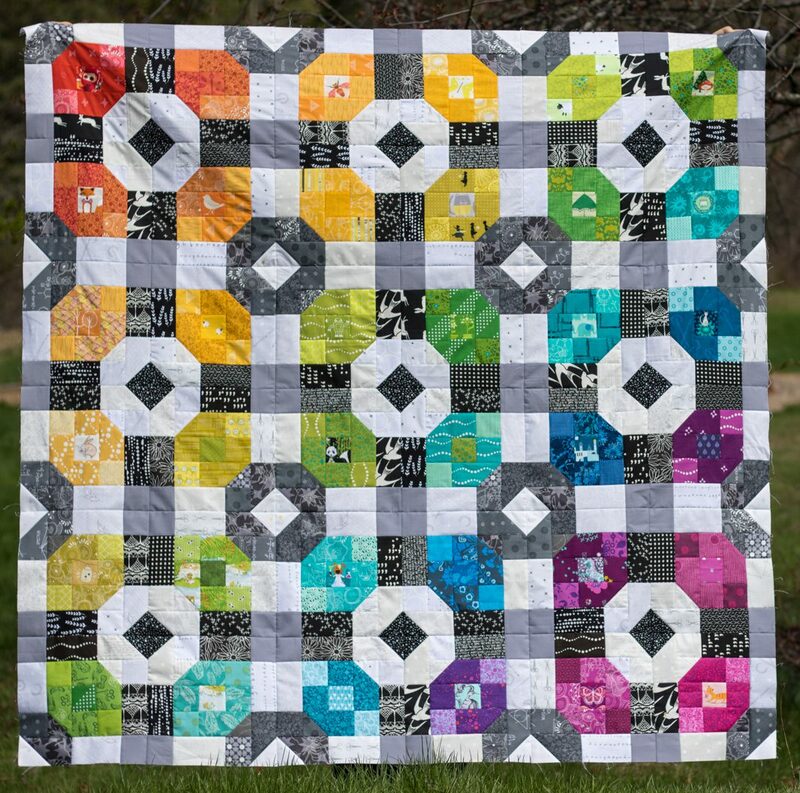 Love your rainbow slant to this quilt! I made this quilt, too, and finished it in time to give it to my son for Christmas. It was a LOT of work to get done in the time frame for the quilt along, but what a great feeling to wrap it up…literally! Your son will cherish this always. Yay finishes AND rainbow quilts. Try something like the infinity/figure eight loops. It’s easy, fast, classic, and works with nearly everything. I wonder if over time every block will be the favourite at least once. That would be fun 🙂 I think an all over design would be beautiful, would let you cross this WIP off your list altogether and would let Max get to play with his quilt. Win, win, win! If I can consider whatever quilt I am currently working on (and I do), then Max can change his mind infinite times about his favorite block. 🙂 As to quilting, I’ve been doing a lot with dove and it blends quite well into a variety of colors. It’s so wonderful that Max loves this quilt already! I like your processes for ensuring a personally pleasing scrappy eye spy & it’s a very clever way to keep it both reigned in & beautiful. 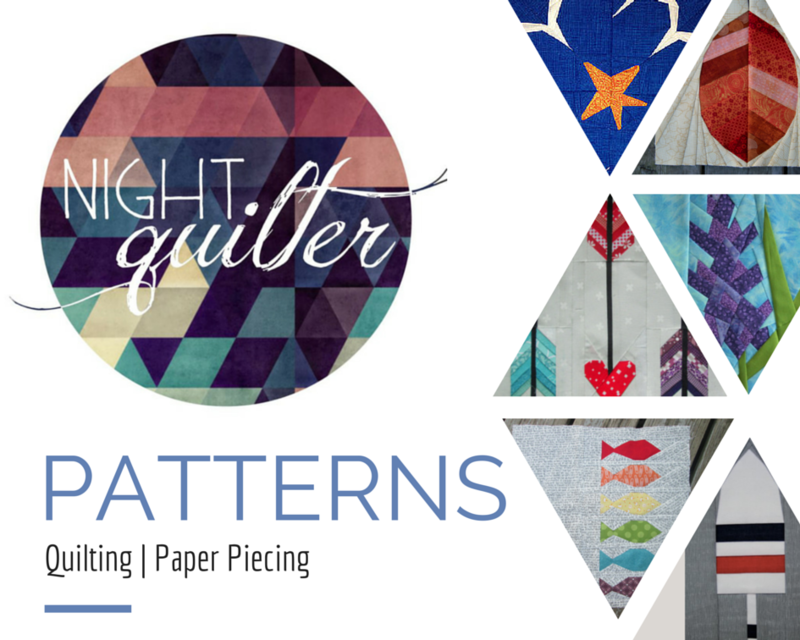 I’ve already weighed in with my opinion on quilting on IG (straight line in 2600) & after reading this post I’d suggest that whatever you choose, the important thing is to get it done quickly for Max! It’s beautiful. 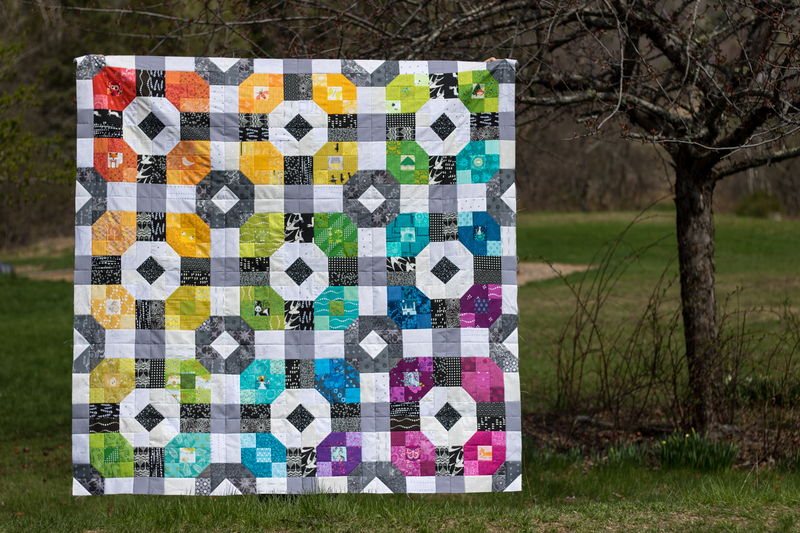 I love the imperfection and surprises in this scrappy quilt combined with the organization by using a rainbow color order. I like the idea of echoing seams in the white and black pattern, then you can do some custom quilting in each rainbow section if desired. oh wow, it’s beautiful! I’m not always a fan of scrappy, but this kind of ordered, rainbow scrappy I just love! This is STUNNING!! Whoa. I have yet to really create anything “scrappy”… but you may have just pushed me over the edge here… Beautiful! Oh my goodness, Kitty, it’s gorgeous!!! Mine is still sitting in pieces, in a basket. Waiting to be touched again. Mine was doing to be done in all blues but I’m wondering if I need to raid my scraps and add all the colors of the rainbow now. It’s just beautiful. It is absolutely wonderful! So much color! Whatever you decide, Max will love it.